Every now and again, you meet someone you instantly love. There's that connection, that kindred spirit, that feeling of having known this soul for a long time when in reality you only just met. That happened to me several months ago when I met Noha Serageldin. Except, I didn't really meet her, as in face to face, but via the social media of Instagram. It was all because of a photo she posted of eggs in a cast iron skillet. 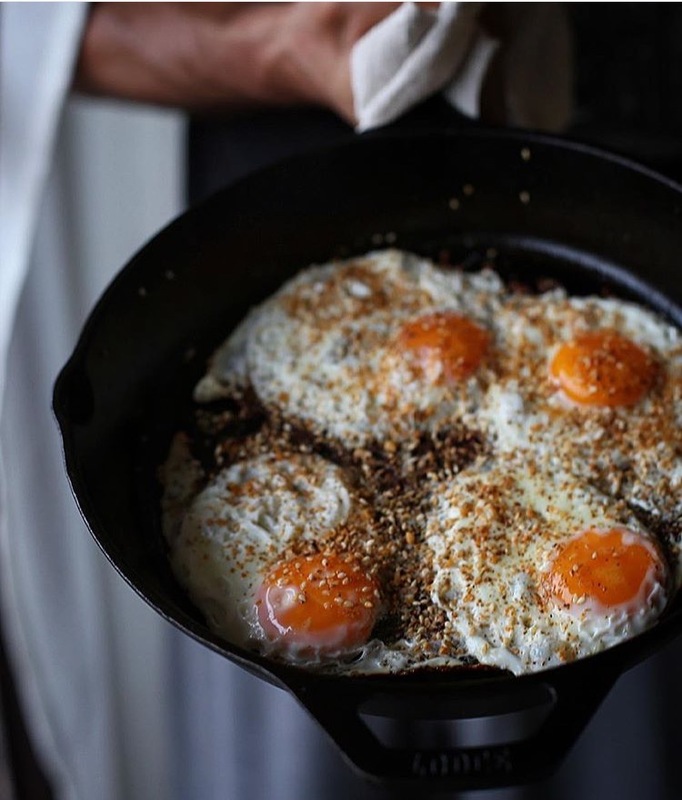 I mean, those were perfectly golden eggs, dusted with Za'atar and fresh thyme, a combination I had to try. The next morning over my own plate of golden spiced eggs, we met. And then there was the cake. 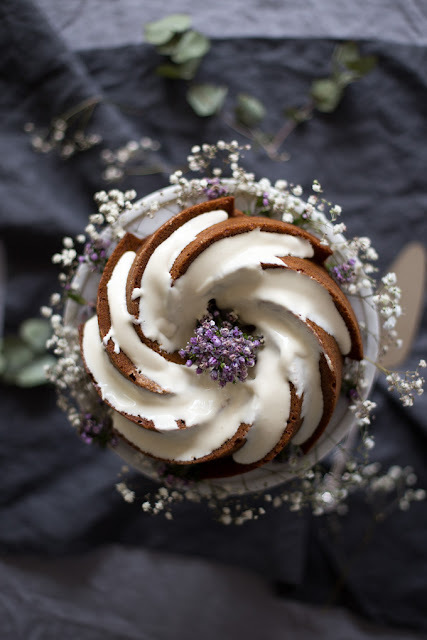 The photo of this magnificent carrot cake took the Instagram world by storm and I rejoiced with Noha as it sort of went on a viral whirlwind of icing loveliness. 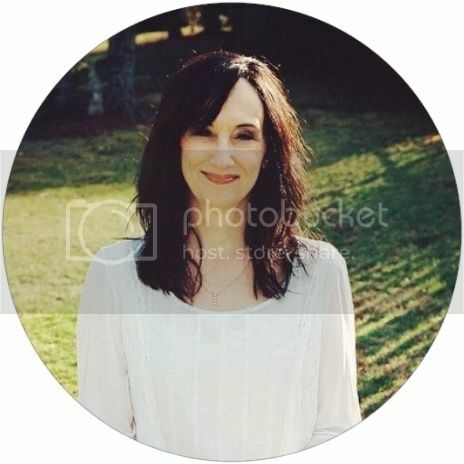 So it seems only fitting for us all to meet this lovely woman who brings such beauty to so many lives daily, and it is my pleasure to give you an inside look at her life. 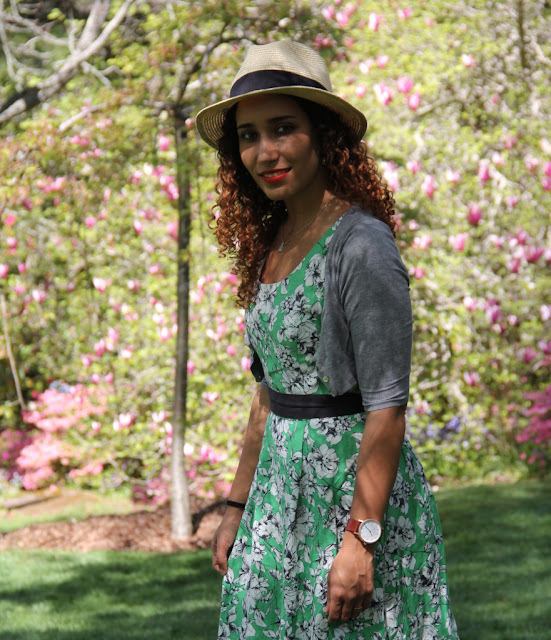 Noha Serageldin, author of Matters of the Belly. Noha Serageldin has spent a lot of her life around a dinner table. Growing up in the bustling city of Cairo with a family who loved to cook, she learned about the pleasures of food and dining at an early age. Later in life, she carried those values into her own home when she married her childhood sweetheart at age 21 and continued the tradition of family togetherness over a beautifully prepared meal. While Noha was diagnosed with a debilitating autoimmune disease soon after marriage, leaving her struggling to lead a normal life, it has not dampened her enthusiasm for food or cooking. She says, "Through it all, I have always found solace in the clinking of metal pots, the gentle bubbling of a simmering sauce, the sweet aroma of vanilla...simply put, the two places I find comfort and consolation are my husband's arms and my kitchen." Noha, tell me about your life currently. I live in Sydney, Australia with my husband. We moved here just over 2 years ago from Egypt. 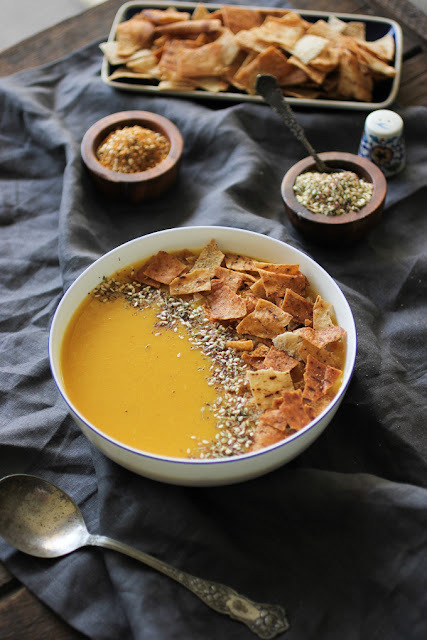 I work as a freelance food stylist, photographer and recipe developer, as well as blogger. I grew up in Cairo, Egypt, which is where I lived until moving to Sydney. It is a crazy, chaotic city to grow up in! We spent our summer vacations on the north coast of Egypt by the Mediterranean Sea, where there are the most beautiful beaches I have ever seen, with turquoise clear waters and the softest white sand. My father was always big on travel so he would take us all on a family trip abroad for a couple of weeks each summer, too. I've been very lucky to have visited a whole bunch of countries, especially in Europe. 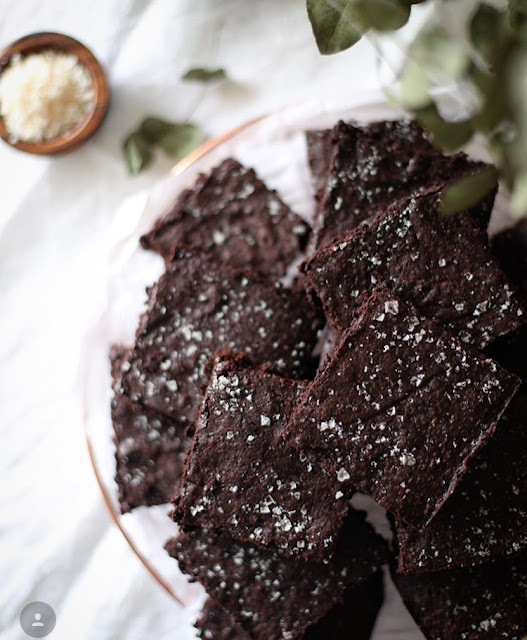 How did you come to love cooking and baking? Were there role models in your life? Oh there sure were! Both my mother and father were always tremendous cooks! My mother used to make the best desserts, and always had my sisters and me helping out in the kitchen (which we absolutely loved!) and my father would throw massive dinner parties where he would cook the most beautiful and lavish feasts. They both taught me SO much about food and instilled in me the love and passion for it. Have you always been a cook or did you work in another profession? I've worked in a bakery as well as in an office and in retail. Basically, I've been all over! But I always knew that food was at the heart of what I wanted to do, and only after coming here to Australia did I feel like it was the right time to focus all my energy and time on it. I studied commercial cookery here at Tafe, then began my blog. The blog has been a wonderful starting point for me into this whole world of creativity and food. I am endlessly inspired by all my surroundings! Cookbooks, big TV cooks like Jamie Oliver and Nigella, all the beautiful food blogs and Instagram accounts that I immerse myself into, the wonderful memories I have of family and gatherings and traditions, as well as the beautiful seasonal produce that I have access to here in the markets and shops. A trip to the grocery store always inspires me to make something new! Have you had any funny experiences while cooking or learning to cook? Oh plenty! I might not look like it, but I am terribly clumsy in the kitchen. I burn myself almost on a weekly basis! And I do have tons of failed experiments, because I believe that the best way to learn in the kitchen is by trying. Many times, these trials are unsuccessful, but I ALWAYS learn something! One recent funny incident was a beautiful cherry galette that I dropped face-down on the floor as I was taking it out of the oven. I was devastated! Most interesting place you have visited? Everywhere is interesting in its own way, I suppose, so I'll tell you the places I loved the most. Greece is pretty much on top of the list. We absolutely fell in love with it when we visited a few years ago. The people, the food, the general vibe. I dream to go back and spend a few weeks island hopping someday! Another place very dear to my heart is actually Sinai, back in Egypt. It has some of the most gorgeous beaches by the stunning Red Sea, as well as being the most laid back place ever. I miss it all the time. Rolling out the dough for potato gnocchi. When the weather is gray and cold, Noha turns to making things that are warm and comforting. 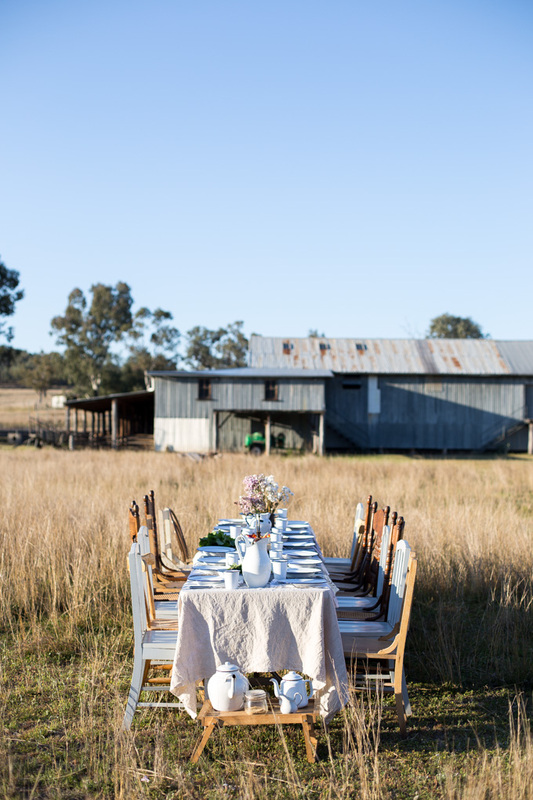 A 3-day creative workshop in the Australian countryside. Read the story here. 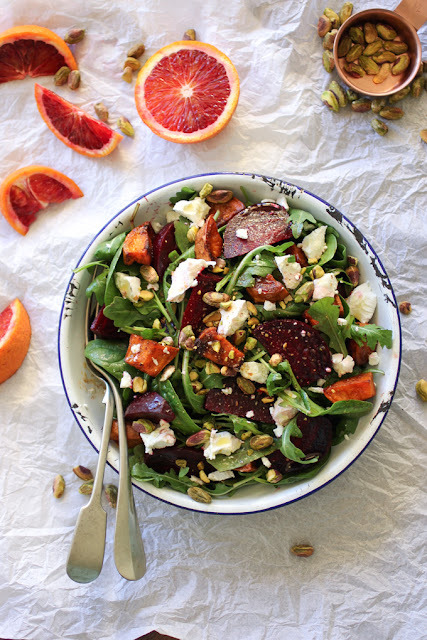 Roasted winter vegetable salad with blood oranges and goat cheese. 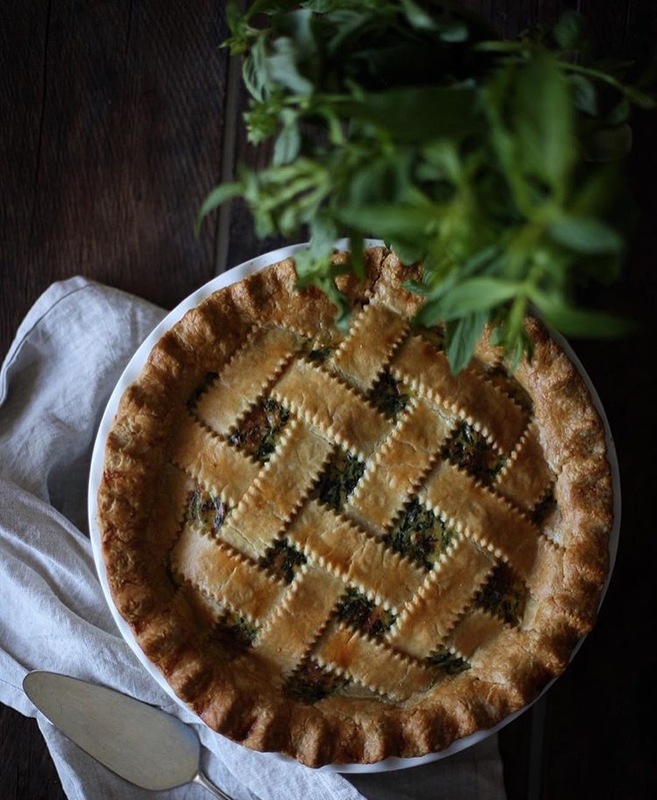 Herbed Ricotta and Spinach pie with spelt crust. 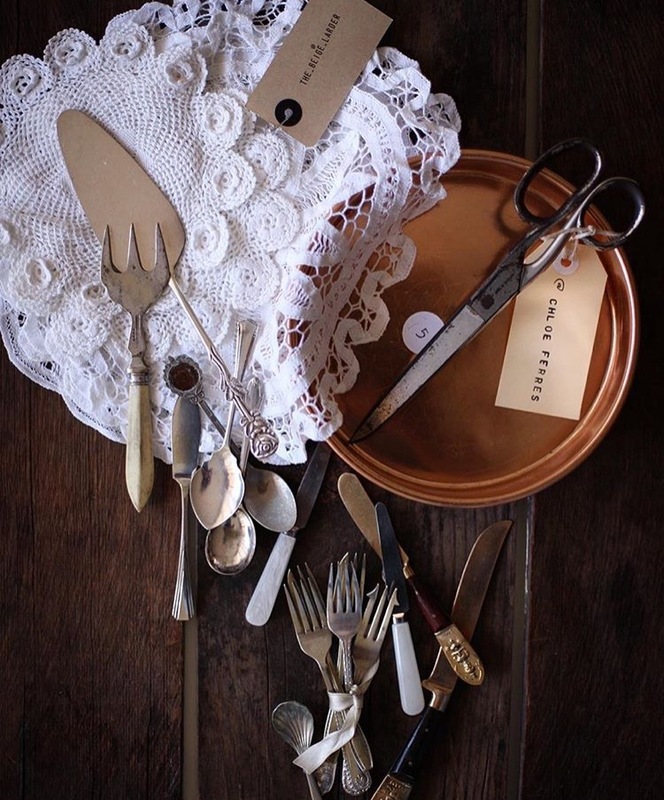 New props for food styling beauty. A healthier yet equally delicious and simple recipe for carrot cake, made with 100%wholewheat flour, light olive oil & sweetened entirely with honey. It is perfect for tea or breakfast! 2. 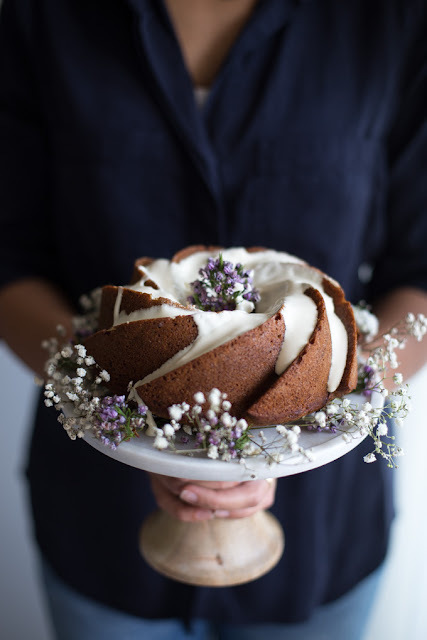 Grease and flour a 6-cup capacity loaf or bundt or regular round cake pan, set aside. 3. In a bowl, whisk together the flour, baking powder, salt, cinnamon, ginger and nutmeg. Set aside. 4. In another bowl, whisk together the eggs, vanilla, honey and oil. Add the dry ingredients in two additions and mix till combined (do not overmix). 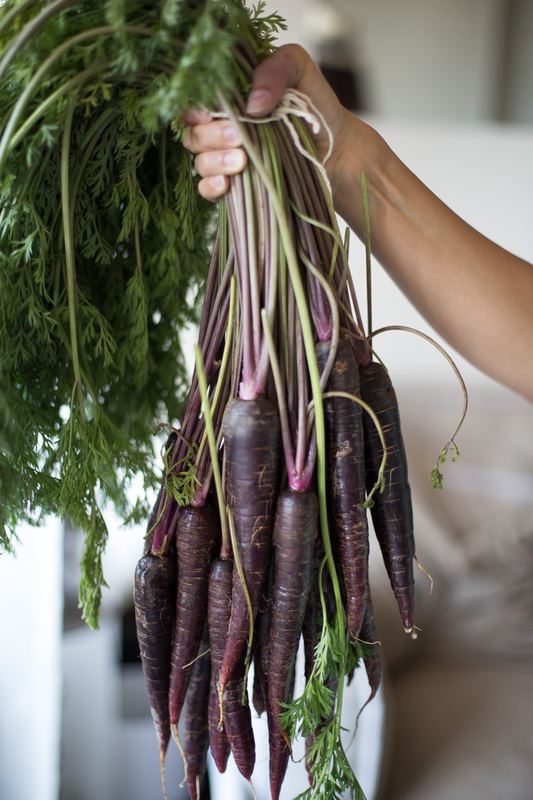 Add the grated carrot and fold through with a spatula or a spoon till well dispersed. 5. Pour the batter into the prepared pan and bake in the oven for about 30 minutes, or until a toothpick inserted in the centre comes out clean (time may vary slightly depending on the shape/size of the pan, check at 25 minutes). Leave to cool at least 20 minutes in the pan before inverting onto a plate. When cooled completely, drizzle with the cream cheese glaze. The cake can be stored in an airtight container in the fridge for up to 5 days. 6. To make the glaze: beat the cream cheese for 3-5 minutes until softened with a handheld electric mixer or stand mixer. Add the vanilla and honey (to taste) and beat until incorporated, scraping the sides of the bowl as needed. Add the milk one tablespoon at a time until it reaches a nice pourable consistency. 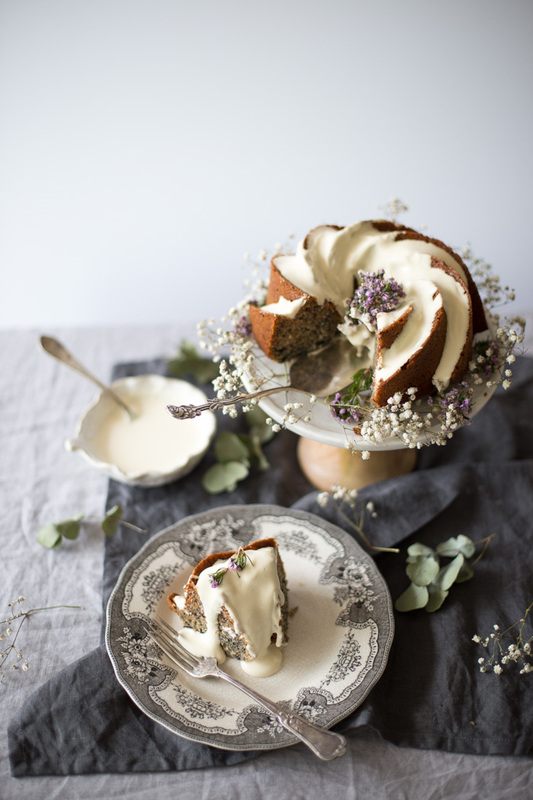 • This recipe makes quite a small cake. Double the recipe for a larger crowd, and note that the baking time will increase by 15-20 minutes, depending on the size and shape of the pan used. Start checking at 35 minutes; the cake is cooked when golden and a skewer inserted into the center comes out clean. 1. Place the potatoes in a large pot. Cover with tap water (cold) and place onto high heat. Bring to the boil and cook for 30-45 minutes, until tender, and a thin sharp knife pierces through a potato easily without resistance. The time will vary slightly depending on the size of your potatoes. 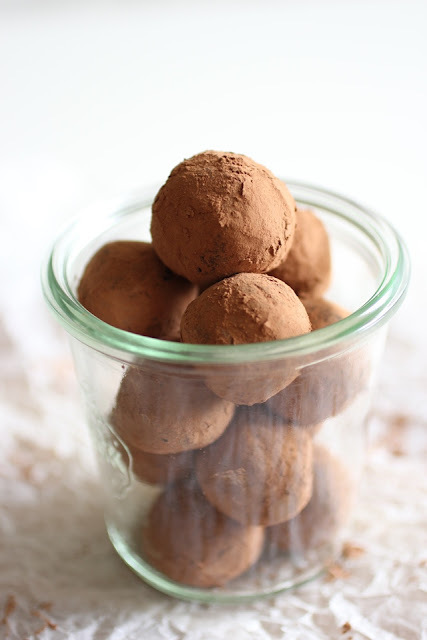 Drain them into a colander and leave them to cool and steam dry until they are still warm but cool enough to handle. 2. Place each potato into a potato ricer (don’t bother peeling them) and press to mash them into tray or onto a clean work surface. Remove the peel from the ricer before adding your next potato. Repeat until all potatoes are mashed. Alternatively, you could use a food mill or a regular potato masher to mash the potatoes, just don’t use a food processor or blender (they will make the mash gluey and gloopy rather than light and fluffy). 3. 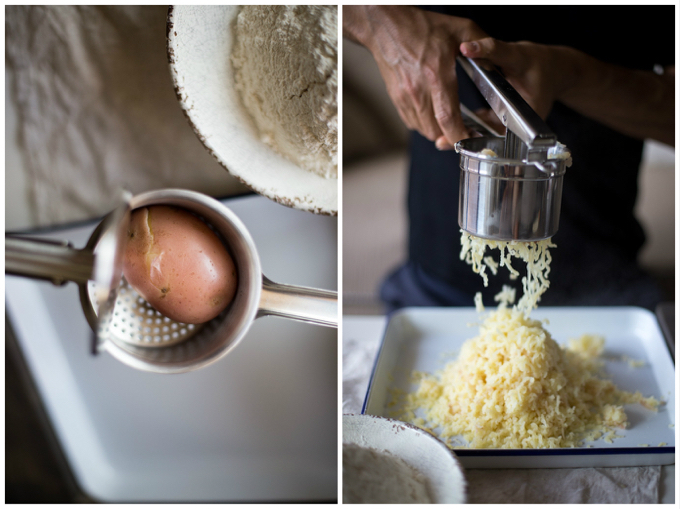 While the mash is still warm (not steaming hot), add the egg, salt and nutmeg (if using) and mix through with a fork. Sprinkle over about a third of the flour and start incorporating it into the potato with the fork. Gradually add more of the flour and stop when it just starts to come together into a very soft and pliable dough. I usually end up using about 320g of the flour, the less flour you use the lighter your gnocchi will be. 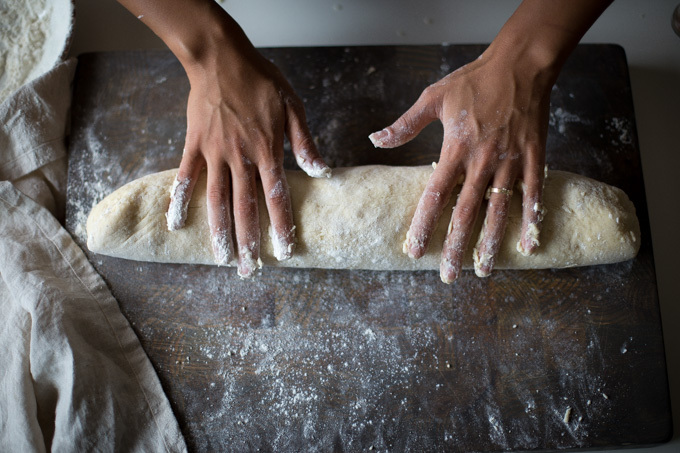 Using your hands now, knead the dough just for a few seconds until it’s smooth, sprinkling with a little more flour if needed. 4. Roll the dough into a log and divide it into four pieces. Roll each piece into a long rope (about 2.5-3cm/1” thick), sprinkling with flour to prevent sticking. Using a sharp knife or a pastry cutter, cut the ropes into bite-sized pieces. Toss the little pillows with a little flour and spread onto a floured tray to prevent sticking. At this point, you can either cook the gnocchi or freeze them, or cook half and freeze half (instructions for freezing in notes)*. The amount of sauce in the recipe above is enough for half the gnocchi (feeds 3-4), so if you plan on cooking the entire batch of gnocchi, double the sauce. 5. Bring a large pot of salted water to a full boil over high heat. 6. While the water comes to a boil, prepare your sauce: simply combine the cream and the gorgonzola cheese into a wide, deep pan on medium-low heat until the cheese melts and the sauce is bubbling lightly. 7. Once the water is boiling and the sauce is ready, cook the gnocchi: add about a quarter of the full amount of the gnocchi (or half if you are just cooking half the full amount) to the boiling water and give it a stir. Let the gnocchi cook until they rise to the surface, this takes only a minute or two. When they are floating on the surface, that means they are cooked! Remove them from the water carefully with a slotted spoon and add straight to the sauce in the pan. Allow the water to come to the boil again before adding the next batch of gnocchi. Repeat until all gnocchi is cooked. Toss the gnocchi with the sauce well to coat and serve immediately, with parmesan cheese sprinkled on top! 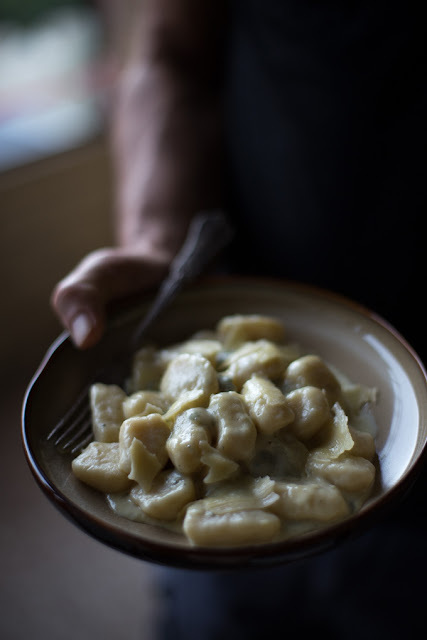 *To freeze the gnocchi: place the gnocchi as they are on their floured tray in one single layer into the freezer until completely frozen, then transfer them into airtight zip-lock bags or sealed containers. This prevents the gnocchi from sticking to each other while freezing. They will keep in the freezer for up to 3 months. 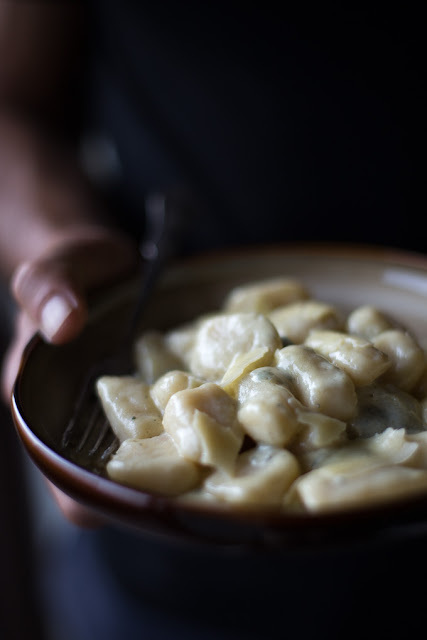 DO NOT DEFROST before cooking, just cook them from frozen: bring a large pot of salted water to the boil and add about a quarter of the frozen gnocchi to the water. Cook until they rise to the surface of the water and float, remove with a slotted spoon into your prepared sauce, then add the next quarter of the gnocchi to the boiling water. Repeat until all gnocchi is cooked. If you add the gnocchi all at once, the water will become very cold suddenly and the gnocchi won’t cook properly and probably turn into a big soupy mess (been there, it aint pretty). Photos courtesy of Noha Serageldin. Used with permission. Oh goodness Naomi!! I am speechless! I'm SO incredibly touched by your wonderful words, i am truly thankful for instagram for alowing me to connect with wonderful souls like yourself! Thank you for showcasing me in such beautiful light, you are an absolute gem! To many more meaningful interactions, until we hopefully meet someday in "real life"! Haha! Much love to u darling Naomi! Thanks again for introducing such a warm person who sure can cook a storm and make it look stunning. She sounds fabulous and the story of the Cherry galette, it happens to all of us. Loved this piece Naomi and Noha.